AFFEERCE promises to forge a path of freedom and democracy that left, right, spiritual and secular can travel together. AFFEERCE is not a compromise between objectivism and subjectivism, but rather a synthesis of the two. The fourth version of AFFEERCE is here! 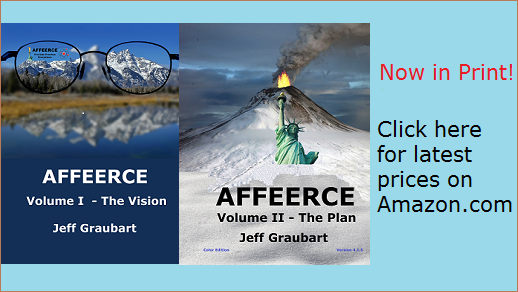 AFFEERCE basics in a 10 page illustrated PDF Download What is AFFEERCE? Join the affeercianado waiting list. Outside U.S.? The AFFEERCE revolution knows no national boundaries. If you wish to customize Volume I - The Vision, or Volume II - The Plan to a different nation or group of nations, contact me about a very fair royalty sharing agreement that will allow you to use arbitrarily large portions of the two volumes, verbatim. Please add your voice to the discussion on Facebook.